Some time in 2016, I went to Google Image Search, typed in “Eggleston Red Ceiling” as search terms and looked at the resulting grid of images. I took a screenshot, and I then proceeded to average out each individual version of the very same picture in Photoshop. The original photograph is mostly red, of course, but the presence of other colours shifts things a little bit towards Bordeaux red. The above shows you these 25 average colours of what in principle should be the same image. And it is the same image, yet it’s also not — some versions found online are redder than others (there are also slight variations of aspect ratios). Would the proper version of Eggleston’s red-ceiling picture please make itself known? Well, what exactly *is* the proper version, given in print it looks different than on the wall (different print processes), let alone, as we’ve just seen online? A few years ago, Steidl released expanded versions of various Eggleston books. I own a set of Democratic Forest (see it reviewed here and here). I also own the original one-volume version that came out at the end of the 1980s. If you put them right next to each other, which I’ve done when teaching, the same image will look drastically different. The 1989 version will look like what you’d expect such an image to look like, given the printing techniques of the time and given what people back then thought a good colour photograph might look like. The 2016 version looks like what you’d imagine the world looks like when you’re on mind-altering drugs. What are we going to make of that? Maybe it all comes down to the fact that there really isn’t such a thing as the world in colour. There’s just what you make it look like, plus there are basic facts such as women being able to see more colours than men. In fact, what colours ought to look like isn’t so clear any longer in photography, or maybe I should say it never was. If there’s one agreement then it is that any resulting photograph should be more than monochromatic, but that’s about it. I mean compare Eggleston’s colours (pick any) with, let’s say, JH Engström’s, then look at Hellen van Meene’s, then at Alex Prager’s… It’s all colour, yet all of these four types of worlds look radically different in terms of how colour is rendered. Bill Sullivan‘s Pure Country makes these considerations its center point. As a start-off point, Sullivan picked the early colour photographs produced by Russian artist Sergey Prokudin-Gorskii (which I’m sure you’ve seen, because roughly every five years, they become “rediscovered” by some larger photo or cultural website as clickbait). For these images, Prokudin-Gorskii produced a set of monochromatic base colour images, which, once combined, will yield a “full-colour” image. With early colour photography like this (there also are autochromes) the game usually revolves around doing the combinations as faithfully as possible, which is a neat idea but which of course for the various reasons listed above will only take you so far. So Sullivan decided to unleash his own ideas of what can be done with these photographs, producing an assortment of images that throw away the idea of faithful colour, to, instead, focus on the artifice of human-made colour images. Throwing in a lot of completely unrelated imagery and visual art, the book then arrives at a visual smorgasbord that teaches the viewer about printed colour on the sly. At times, I was reminded of Fake Flowers in Full Colour by Hans Gremmen and Jaap Scheeren, which, however, started out from scratch — using white plastic flowers and C, M, Y, and K spray paints (plus some very basic Photoshopping). If my description sounds at all as if these two books are pointless and tedious (like so much of the New Formalism craze that now thankfully is on its way out), then that’s really not the case. They’re fun, smart, and engaging. 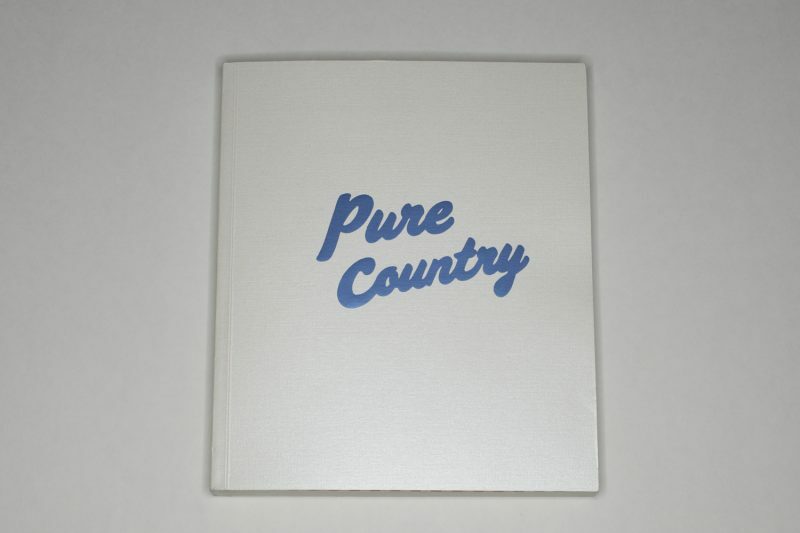 Pure Country comes with a multi-page index that discusses colour theories and the production of colour imagery in detail, and even that part is fun and engaging. At the time of this writing, the publisher’s website says the book is “back ordered,” asking for interested viewers to check in for availability updates. For sure, I hope the book becomes available again.